Mill-Max has expanded its triple row connector series' to include long stroke, through-hole mount spring-loaded pins and mating target connectors. These connectors are on .100" (2,54 mm) grid and available in 9 − 96 position configurations. Triple row connectors provide the designer the flexibility of a single connector solution in place of using separate single and double row connectors; this can be useful when the available space allows for additional rows but not a longer connector. The triple row connector also ensures more consistent pin to pin spacing and improved perpendicularity across the field of pins. The 804 series spring-loaded headers provide .045" (1,14 mm) of stroke at working travel and .090" (2,29 mm) maximum stroke. Each contact has a current rating of 2 amps continuous, 3 amps peak. The precision-machined piston / base and gold-plated components assure a 1,000,000 cycle life durability. The 804 series is designed for manual placement into ∅ .030 ± .003" (,76 mm ± ,0762 mm) plated through-holes in the circuit board, prior to soldering. 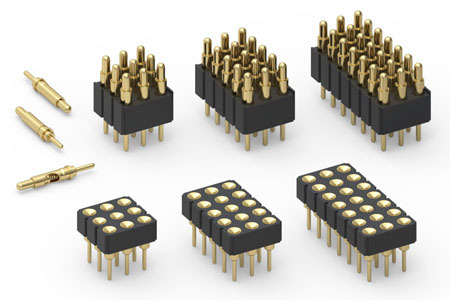 The 805 series target connectors provide an excellent gold-plated conductive mating surface for spring-loaded connectors and are designed for through-hole solder mounting in a .025 ± .003" (,63 mm ±,0762 mm) hole. This series is offered with a concave face for making contact with our standard .042" (1,07 mm) dia. spring pin plungers. Both the 804 and 805 series high temperature thermoplastic insulators are suitable for wave and reflow soldering processes.